What are the steps to create a RecruitiFi account? 2.) Apply to be a part of the Community. You'll need to apply to be a part of our Expert Community to see if we'd be a good fit for each other's businesses. We also need to keep the number of recruiters and opportunities appropriately balanced. If you are accepted you will be asked to create an RecruitiFi account. If you have already applied and have been accepted, here is the step by step on setting up your account. Populate your profile with all the relevant information. Please make sure that your email is one that you check on a regular basis, as this is where you’ll receive Notifications about JobCasts and Candidates. Any fields that are not filled out properly will be marked in red. Select up to four roles that you specialize in. Note that the roles are the function of the candidate in the organization—not the industry of the organization itself. Example 1: You recruit medical device sales reps. The Role selected should be Sales (not Health Care), because that is the function the candidate fills in the organization. 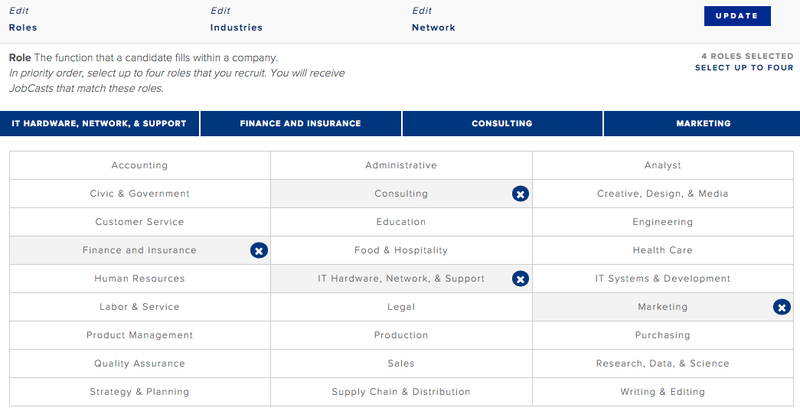 In the next section, when you select your Industries, you can specify that you recruit in Health. Example 2: You recruit office assistants for law firms. Select the industries you specialize in, select all that are applicable. Example 1: You recruit sales reps across all industries. For your Industries, you can select every category. In step 2, you should have selected Sales for the Role. Example 2: You recruit PeopleSoft developers for hospitals and medical facilities. Level: Select all the experience levels of the talent in your network. Geography: Select the regions where you recruit. If you only recruit in a single state/city, pick the region that covers it, and reject JobCasts that fall outside your area. If you recruit everywhere in the U.S., select all of the regions. If you can recruit internationally in certain countries designate that as well. Once completed, you will immediately be matched with 20 JobCasts according to your profile settings. Please click X and ✓ to give us feedback on the relevance of these and your ability to recruit for them. This will help us better learn your preferences and get you more precise JobCasts in the future.